Ask the Doctor: Can You Bulk From Too Much Strength Training? “Many women worry that strength or power training will “bulk” them up. Although body aesthetics are completely subjective and personal, a common fear is that there is a muscle size threshold past which “toned” becomes too “masculine”. To stay lean without getting too “jacked”, a lot of women eschew resistance and strength training exercises for a low resistance workout regimen. But does science support this concern? Can you get too “bulky” from too much strength training? The answer isn’t as simple as you think. There are many factors that affect the growth of muscle mass. 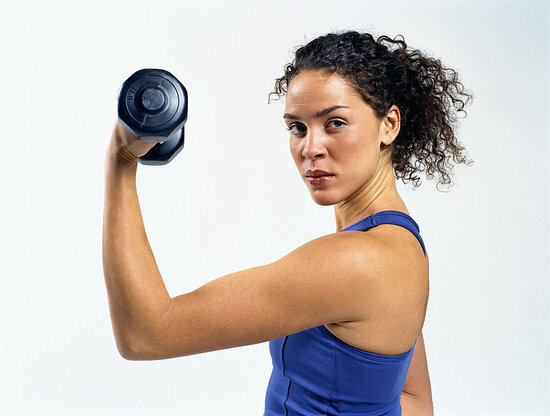 Genes, hormones, our past activity level and our body composition all influence the results we see after working out. Those things are either hardwired or in the past, and therefore out of our control on Day 1. And strength training does indeed induce muscle hypertrophy (muscles getting larger) by stimulating muscle cells to grow more than during aerobic exercise. (The “growth” comes from a combination of increased water content and an increased number of specialized proteins in the muscle cells.) But in order for muscle cells to get a lot bigger, two other requirements need to be met: You have to eat a lot more than usual and you have to do high resistance exercise sets of no more than 12-15 repetitions or less before failure. Exploring the influence of diet a little more shows the following: In order to support significant muscle hypertrophy, a person’s diet has to surpass requirements of daily calories (44-50 kcal/kg) and protein (1.2 – 2.0 g/kg). For a 125 lb woman, this amounts to about 2500 calories and 100g of protein a day, both above the recommended daily allowance (RDA) proposed by the American Society for Nutrition for a similar sized woman. Dr. Guillem Gonzalez-Lomas is an Assistant Professor of Orthopaedic Surgery at NYU – Hospital for Joint Diseases in New York. He specializes in arthroscopic surgery, ligament and tendon reconstructions and sports related injuries.